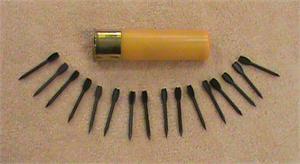 Flechettes are 1.” dart shaped projectiles for use in taking out snipers hiding in the thick brush or trees. Due to the penetration of these projectiles, tree limbs and brush will not disperse the darts as readily as round shot. They will give an all covering pattern within trees and brush. Not intended for hunting. These were heavily utilized during the Viet-nam era, often referred to as the “beehive” round. These rounds have 18-20 1″ darts, about 10 darts less than the 12 gauge 1″ flechettes round but these darts will have greater range and penetration. We sell this round for novelty purposes. This round is not legal to possess in Florida, Hawaii, Illinois, NYC, Washington DC, etc.